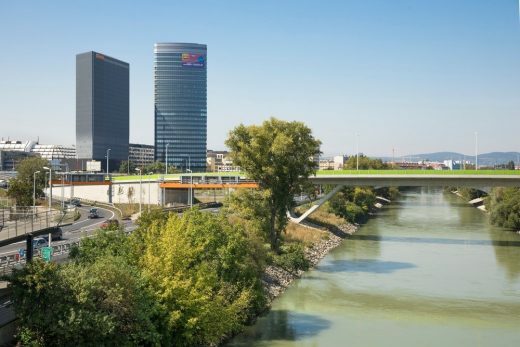 In the immediate vicinity of the new Vienna central station, the Sonnwendviertel East is arising along the Helmut-Zilk-Park. Based on a cooperative master plan, a district of diverse uses is developing where eleven of the buildings are going to be so-called “Quartiershäuser” – characterised by the idea and aim to fuse service and living in a modern urban context. 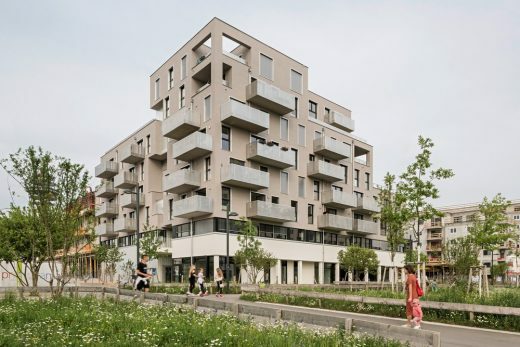 Characteristic of these are a public use of the ground floor which aims to animate the immediate neighbourhood. To ensure this outcome, the future users of the ground floor spaces were involved already during the competition phase. The Quartiershaus designed by feld72 – The House by the Park – illustrates its prominent urban location at Helmut-Zilk-Park via a highpoint on its corner. 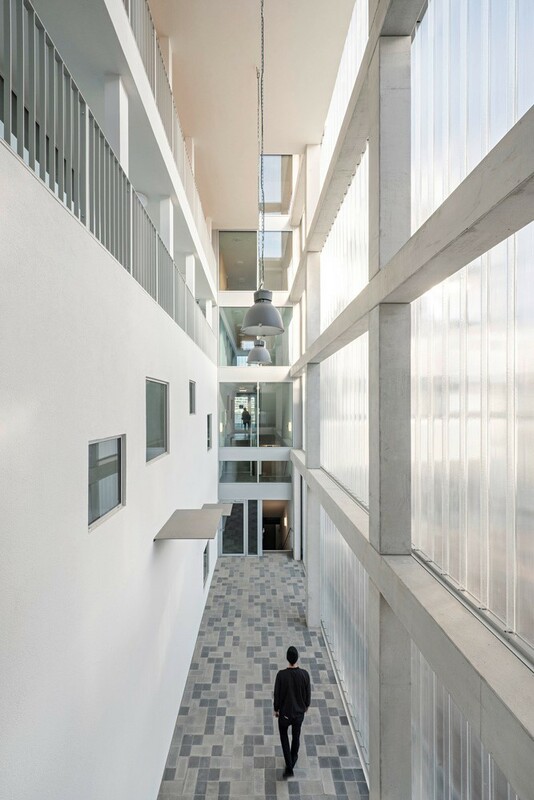 This staggered height awards the building a significant appearance whilst simultaneously optimising the incidence of light to neighbouring buildings as well as its own atrium. 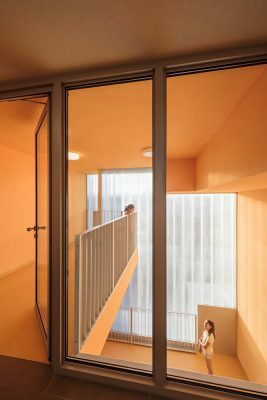 The house actively integrates its environment in that the transitions of public and semi-public spaces on the ground floor are fluid and its boundaries are open. Along the park, a path leads across the arcade to the adjacent building group, “Gleis 21”. The open courtyard establishes the connection to the adjoining Quartierhaus “MIO”. 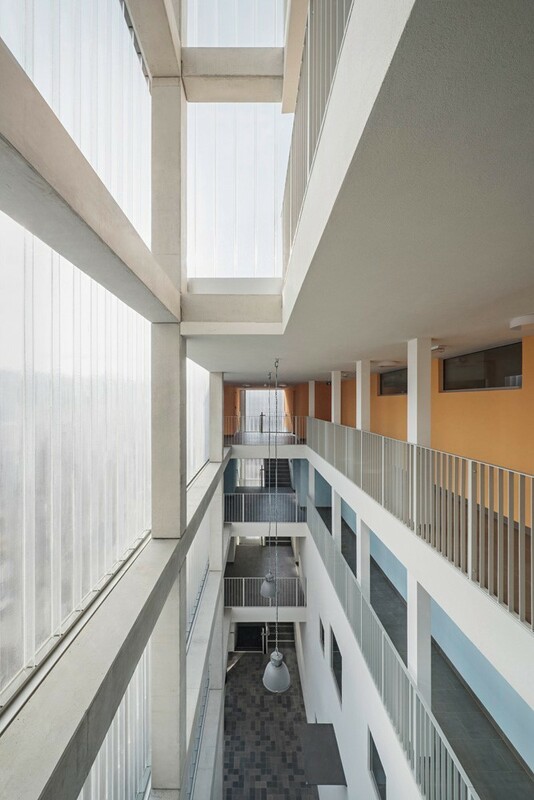 the Profilit glazing and bright plaster allow for a translucent and light effect. Above are the residential floors with floor-to-ceiling windows, metallic soffits, textured plaster and playfully set balconies. 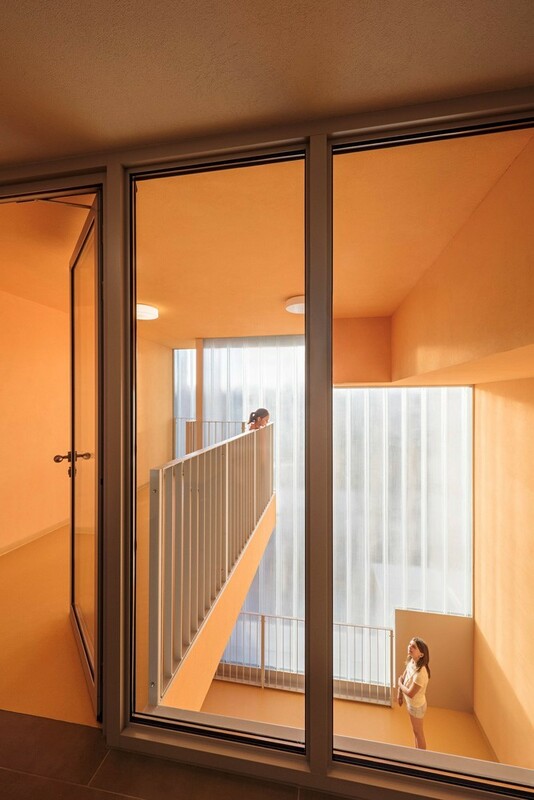 A cantilevered city balcony on the 1st floor marks the entrance to the house and is canopy as well as interface between the public first floor and the residential levels above. 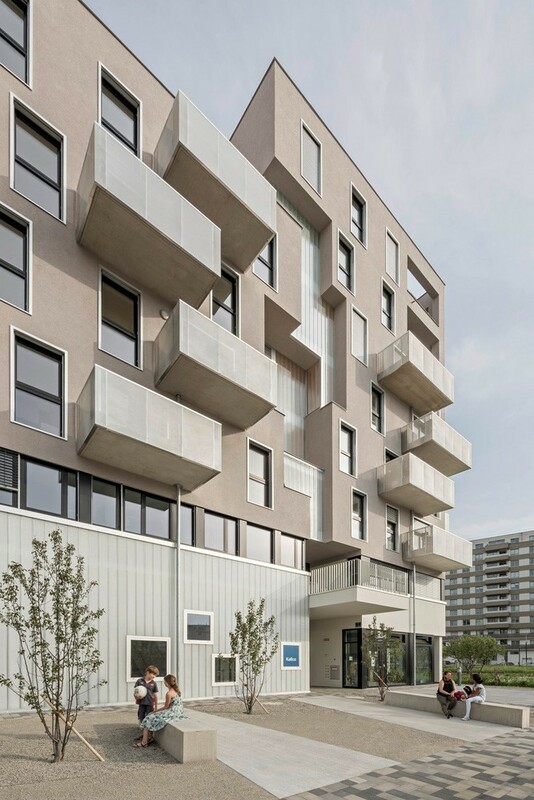 A vertical space made of Profilit glass – the so-called Proszenium, the “little stage”– runs as a striking fugue through the façade and is spatially clearly visible from the outside. 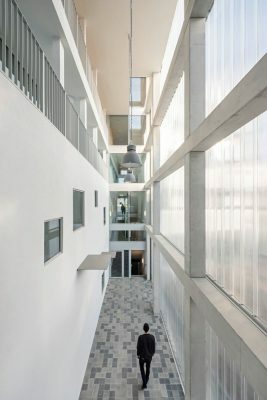 It forms the spine of the building and combines the naturally illuminated access room with the vertically arranged common rooms. The differently shaped levels and the play with light and color yield an unusual spatial experience. By day and even more at night, the translucent Profilit panels show the contours of activities within like a shadow play. The surroundings of and the happenings inside the building become the basis of a mutually inviting relationship. As an extension of the Proszenium, the atrium with its translucency vertically opens up the floors. The Profilit glazing to the courtyard and the different wall colours on each floor give this central meeting space a very special atmosphere. 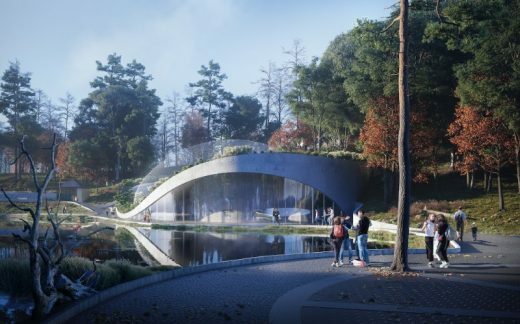 The park, public and semi-public as well as private spaces enter into a symbiosis with flowing transitions. The forecourt is a barrier-free meeting zone and combines the uses of the ground floor and the city via the dance studio’s Kid’s Stage. The atrium presents a calm space for recreation whilst simultaneously providing an interface with the neighbourhood. The playground faces the adjacent building group. A roofscape with various communal and private terraces crowns the building. 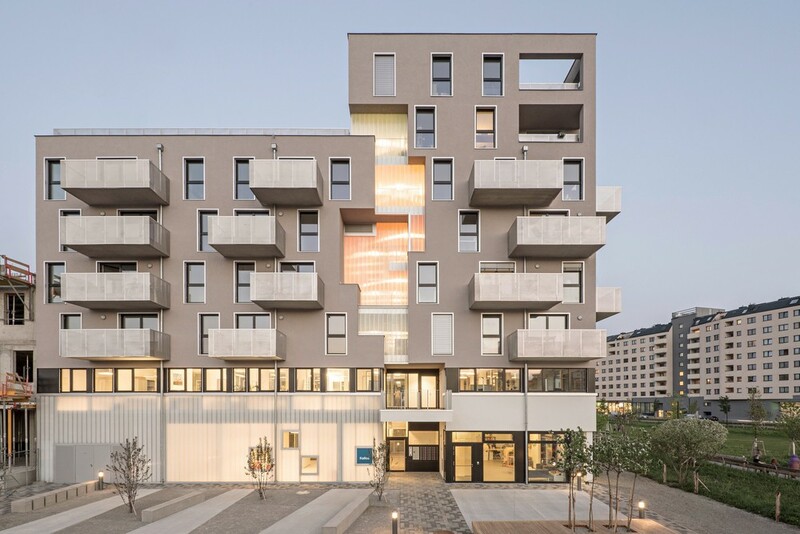 The communal terrace “Chilletarium” on the roof of the fourth floor serves as an area of relaxation whilst vegetables are grown on the roof of the sixth floor with panoramic views over the city. All open spaces were designed by YEWO Landscapes and Susanne Kallinger. 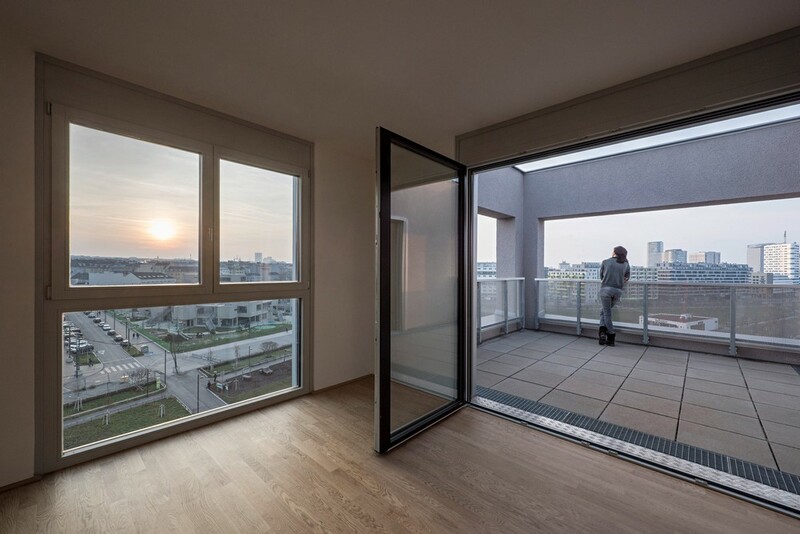 The 29 apartments are between 38 m² and 120 m² in size and all have a balcony. The room height of almost 2.6 m ensures increased quality of living. 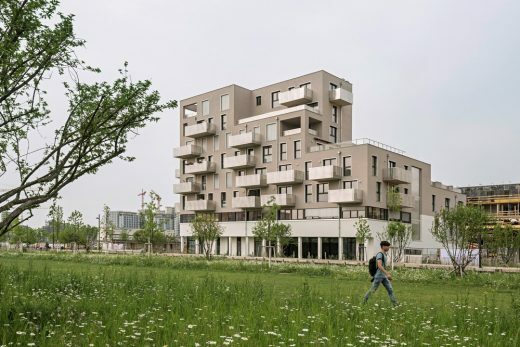 One- to four-room apartments are all represented although a focus was placed on creating two- to three-room apartments thereby supporting the social mix in the building and offering housing for residents with diverse needs. The building was designed according to the patented SLIM BUILDING® principle developed by the client KALLINGER PROJECTS. 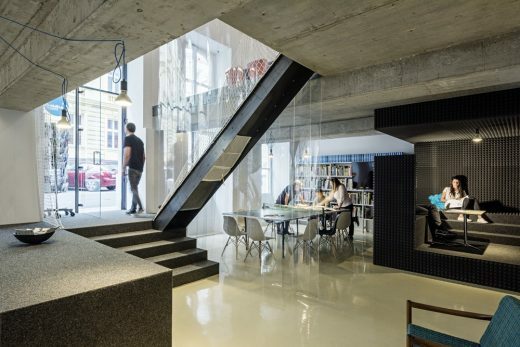 The ceilings are integrated into a modular support system made of slenderly shaped steel columns with the aim of greatly reducing load-bearing wall elements. The open modular structure allows for architectural flexibility and convertibility in the life cycle of the building – a sustainable system that is adaptable to varying housing needs.